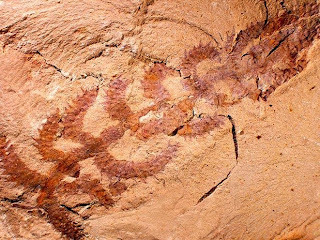 Life Before the Dinosaurs: Diania cactiformus. Diania cactiformus could have been the missing link from lobopods to arthropods. It had strong armored legs and spines all over them. Diania cactiformus had a rattle-shaped head with no eyes and a squishy body. 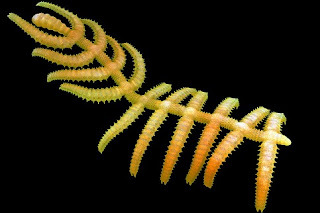 Some of its twenty legs could stick upwards, possibly to grab prey. It was 2.4 inches long. 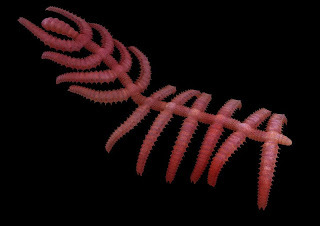 Some scientists believe that the legs got armored before the body did in evolution between the weird soft-bodied worms and the arthropods. This weird lobopod was discovered in China. Diania cactiformus has two nicknames, "walking cactus" and "cactus worm." Looks a bit like a pycnogonid, don't you think? I had to look that up, but I do think it looks kind of like a Diania cactiformus. When I was in college, I liked biology a lot and knew I wanted a biology degree, but wasn't sure what I wanted to do with it. As it turns out I ended up in a job where I barely use it at all (that happens a lot). But still, back then I was hoping to find some part of biology that I would REALLY love. One day, my lab professor set a terebellid worm in front of me, and I knew I had found my love. This thing was like an alien, all weird pulsing body and twirling corkscrew gills and spaghetti tentacles! I'd never seen anything like it. That professor showed me shimmering swimming sea cucumbers, predatory worms with nightmare fangs, huge sea slugs with faces like Saint Bernards; and of course, cephalopods. That creatures such as these can share the same planet as I was a revelation; life can, and does, explore possibilities beyond my imagination, and that's just in my backyard! Who knows what wonderful creatures live on other worlds! I had to look up terebellid worm because I had never heard of that name for it. I'm familiar with the "bristle worm" name for it. I really love marine invertebrates! You know how you said you would worry about copper poisoning the polychaete worms and worrying about getting fish because you were worried about them eating the octopus or the octopus might eat them? That's kind of how I would do it. I would be worried about the same things. Because I really love the polychaetes and the octopus. Yup! So did my professor. She made sure we had lots of fun invertebrates to play with. There's nothing quite like the feeling of a sea urchin's spines (one of the not-too-sharp species!) slowly squirming as you cup one in your hand. She was braver than most of us, though. She'd handle some of those nightmare-fanged worms with her bare hands! Were these recently described/discovered? Or were living relatives recently found? I remember reading about these in the last year. @jaranath I would probably hold some of those fanged worms too! @sjnelson Diania cactiformis was only discovered in 2006.